Now that Hayley Mills was an 18 year old young women, Walt Disney was looking for more mature roles to branch out her talents as well as a way to diversify to typical type of films he was known for. Taking a queue from master filmmaker Alfred Hitchcock, he greenlit a suspenseful mystery that he expected would appeal to kids and adults. The film is based on a 1962 novel of the same name by Mary Stewart. James Neilson was brought on to direct, who had previously worked on Bon Voyage!, Summer Magic and episodes of Zorro for Disney. Michael Dyne adapted the screenplay for his only Disney film. Peter McEnery plays opposite Hayley Mills in his first of two Disney films. Walt Disney personally coaxed Paola Negri out of retirement. She had been a big silent film star who retired from the screen in 1943. Beyond that, most of the faces were new to both Disney fans and American audiences, since the film takes place in Greece and uses a largely international cast. Much of the film was shot on location in Greece, with interior sets filmed in England at Pinewood Studios. Terry Gilkyson wrote the title song. The credits play against footage of beaches and windmills as the Greek-inspired title song plays. We are introduced to Nikky and her Aunt Frances on an overcrowded bus heading to an Inn called The Moon-Spinners in a small village in Greece. The owner tells them they aren't accepting guests, but Aunt Frances convinces the owner to let them stay. They quickly learn that it is the owner's brother Stratos who has requested that nobody stay at the Inn while he is up to something suspicious. They meet a young man named Mark that evening during a party that the whole village is involved in. Stratos thinks Mark knows what he is up to after seeing him swimming dangerously close to where he is hiding something. When Mark goes missing, Nikky runs off to look for him. She finds him wounded in a church and she returns to the inn to get him clothes and bandages. When Aunt Francis notices her first aid kit is missing, she tells Stratos who realizes that Nikky is helping Mark and takes off after them. Stratos finds Nikky and assumes that Mark told her everything. He ties her up at the top of a locked windmill. Mark saves her in the just in time before Stratos returns with a gun to kill her. Mark tells Nikky that Stratos stole jewels from a countess in England and his hiding them. Nikky and Mark are found by the British Consulate, who it turns out is in cahoots with Stratos. Mark runs back to the inn while Nikky sneaks on to the yacht of Madame Habib, a wealthy eccentric lady who had arranged to buy the jewels from Stratos. Mark chases Stratos onto the ship where a fight breaks out, resulting in the police coming on board to arrest Stratos. 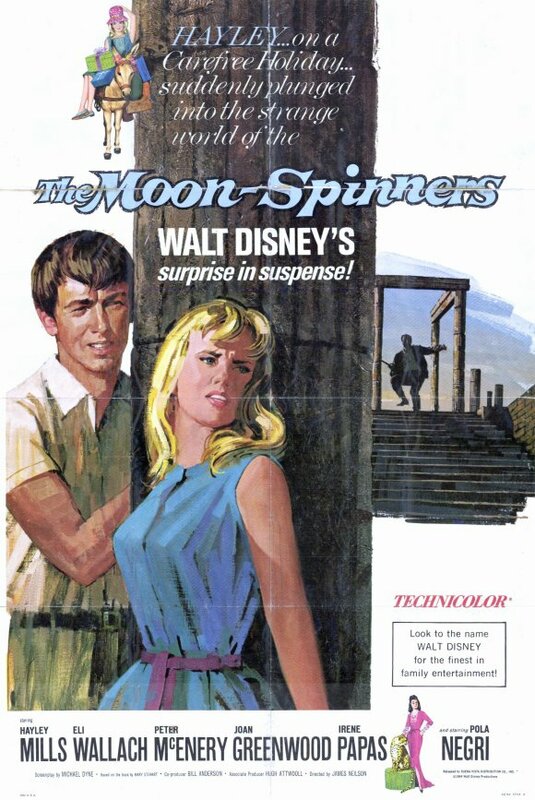 The Moon-Spinners premiered on July 2nd, 1964 and opened in theaters on July 8th. Critics said that the mystery wasn't entertaining enough for adults and would only be suitable for kids. And while they agreed that the actors gave great performances and the shooting locations were beautiful, they found the plot to have too many twists and not enough payoff. It was not a success at the box office and made its TV debut in 1966. It was released on home video in 1985. While Disney's intentions may have been to make a Hitchcock-like thriller, the end result doesn't hold a candle to any of his films. The audience doesn't find out what Stratos is up to until an hour into the film and his schemes frankly aren't that interesting. The films strengths are the great performances by the actors and the authentic shooting locations. Because Paola Negri had retired from acting and was lured back by Walt Disney, this was her last film. The windmill was built by the production crew in Greece. The Moon-Spinners is currently available on DVD. The film is presented in pan & scan fullscreen, but it was originally shown in theaters in a widescreen aspect ratio of 1.75:1. A minor restoration appears to have been done. There aren't any bonus features. The film is also available on iTunes where it is presented in widescreen and can be purchased in HD. But a lousy movie is virtually absolute across the board. I must watch online on 123 movies.